We take so much for granted nowadays. If we wish to rent or buy a house or flat we expect all the essential services to be laid on and barely give a thought as to whether a property might just not be connected to mains electricity or gas; that it might not be connected to mains water; that the structure could be so sub standard as to let in the wind and the rain and perhaps most important of all (and perhaps furthest from our thoughts) that the property was not connected to the sewerage system, did not have a bath or shower and particularly a toilet of its own. Back in the 1920s, that's within the lifetime of many of Exeter's present residents, Exeter was NOT a lovely place to live in by any stretch of the imagination. To quote the Express & Echo report of the time "It is doubtful if the word "slum" conveys to the average reader the vaguest idea of the apalling insanitary, overcrowded hovels in which hundreds of men women and children have to live, or rather exist, in the heart of this Beautiful (Lovely?) City." So, without further ado let me tell you the story of one man's attempts to alleviate that appalling situation and how, with the help of like minded and dedicated persons, created an Organisation that still exists today and continues to build on its achievements over its 86 year history and provides homes for well over 2,000 people in its one thousand plus properties, principally in Exeter. Charles Newton Lovely was born in Calcutta, India in 1864, one of nine children of the Rev. George and Margaret Lovely. He studied Medicine at Durham and gained a Primary Medical Qualification in 1889. He married a Nina Allison in 1890 and moved to Holborn Lodge, Exmouth about 1892. 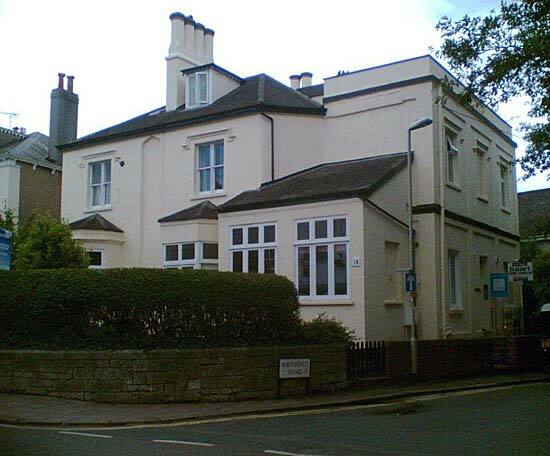 In 1897 he took a lease on The Knowle, Barton Terrace, Dawlish (Now Dawlish Museum) and practised his profession there. 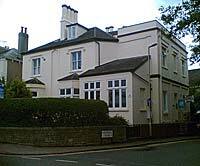 He also worked at Dawlish Cottage Hospital and he set up The Infirmary in the High Street which lasted until 1903. He had three children but his wife died suddenly aged 49 in January 1907, having contracted pneumonia. She was buried in Dawlish Cemetery. Charles met and married a Grace Fenner in 1911, by whom he had 2 children. Whilst at Dawlish he was elected a Councillor on the Urban District Council. He served four years at a Devon Military Hospital during the 1914 - 1918 war. 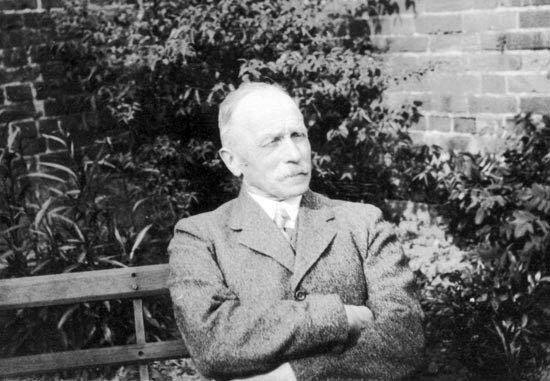 In 1920 Dr Lovely moved to 18 Magdalen Road, Exeter where he, with the assistance of two partners, continued in practice until his retirement in 1936. It was whilst he was in practice in Exeter that he came face to face with the appalling housing conditions faced by many of Exeter's poorer inhabitants. 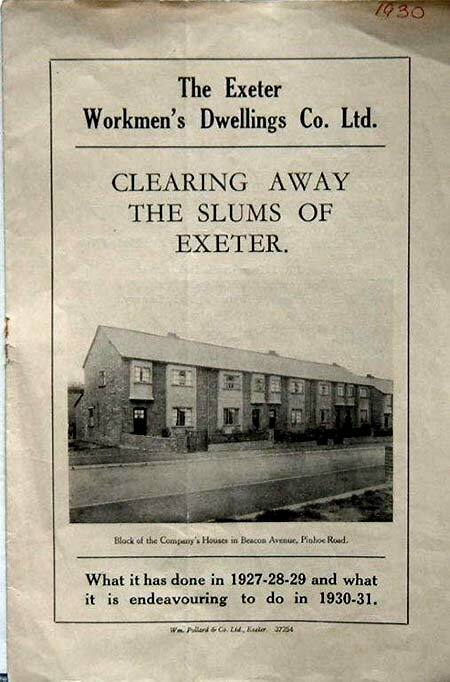 Infuriated and exasperated by what he and others considered to be the ineffectual approach of the City Council to alleviate the situation he, with other like minded, in 1926, founded an association with the aim of rehousing families from the slum areas of Exeter. 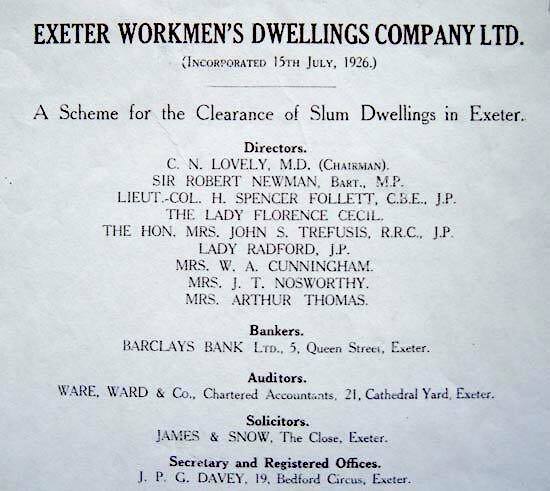 The Association was named The Exeter Workman's Dwellings Company Limited and funds were raised by the issue of £1 Shares to those of the public that shared in the desire to alleviate the conditions in the slums. 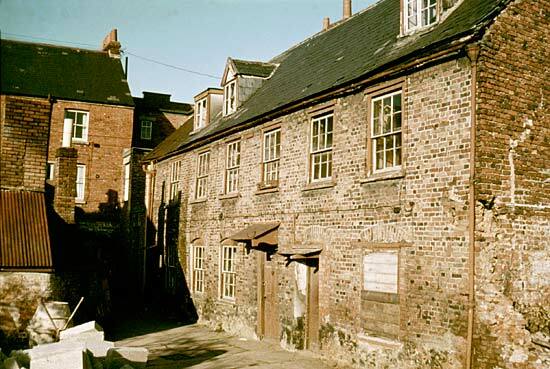 These areas being particularly in the West Quarter of Exeter where many people worked in the foundries, tanning works and other industries on Shilhay and Haven Banks. Here there was intense overcrowding and the area was a rabbit warren of courts and small houses. The Gazette of 13th October 1926 described the operations of the E.W.D.C. 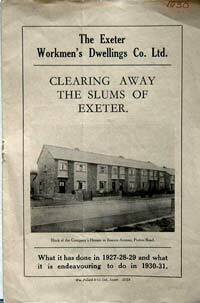 to be "a scheme for the clearing up of Slum Dwellings in Exeter." and went on to state that a share capital required was £7,000 of which about half was subscribed when the prospectus was issued. It describes houses as being erected in LOOE ROAD close to St David's Station. The Company proposed to let the five that were nearing completion for 10/- a week including rates. The remaining fifteen the Company hoped would be completed by the Christmas. The condition was to limit the houses to people who would vacate slum property that would be demolished, five already having been allocated to that class of person. Of the five, one family came from Stepcote Hill and another from a sunless back court in St Thomas; another came from what the Gazette described as follows – "A very dark place in a deplorable state, the roof is very leaky, the place is infested with rats, mice, bugs and other vermin. The family includes several young children." These characteristics were typical of many of the fifty applicants for the tenancies of the new properties. 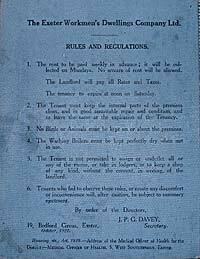 One of the great stumbling blocks of the period was the fact that even though the Council were making efforts to create new Council Housing the prospective tenants simply could not afford the rents for the Council Houses, even though the rate set by the Council was considered "uneconomical." The E.W.D.C.housing provided was light, sanitary and comfortable and compact, where the mother would have a chance to raise children in suitable surroundings and where the husband could have a real home to come home to after a hard day's work. Dr Lovely became Chairman of the E.W.D.C. and soon the Company's efforts bore fruit. In the period 1929 - 1932 the Company constructed a block of houses in BEACON ROAD, Pinhoe. Houses were erected in WATER LANE, FORDS ROAD, HAMLIN LANE and CLAYTON ROAD. 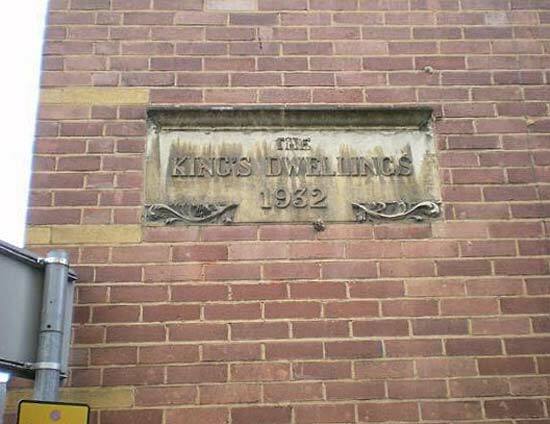 In 1932 the Company applied for subsidy to erect flats at what was proposed to be called KINGS DWELLINGS. The development consisted of 15 flats comprising of three rooms and fitted out with Electric Light, Cooker and a Bath with a likely Rental of 5 to 6 shillings a week. The completion of the block of flats was marked by an Opening Ceremony performed by Miss Violet Wills (who had donated Honeylands to the City) on the 12th September 1933 and was followed by an American Tea, with music, at the Barnfield Hall. In 1933 there were over 400 families on the Company's waiting list. 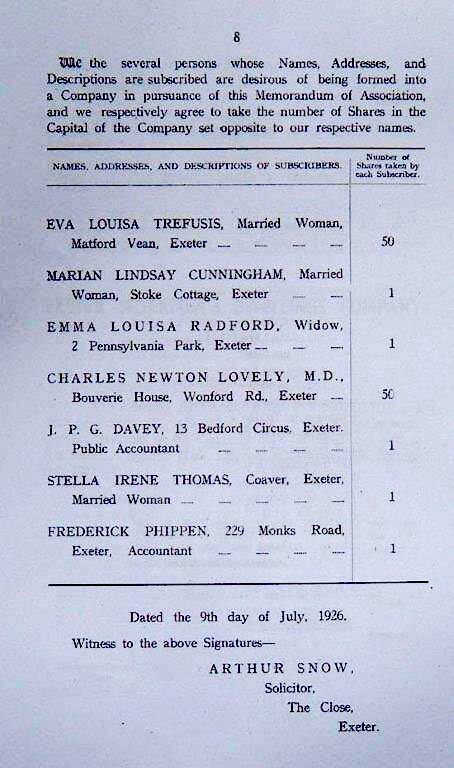 In spite of the Company's achievements the Western Morning News on the 18th December 1933 stated:- "Dr Lovely, whose experiences makes him an authority, states, however, that over-crowding in Exeter today is as bad as it was seven years ago and he was able to quote an instance in which one family of ten are occupying two rooms at the present moment. He asserts there are hundreds of similar cases in the City." 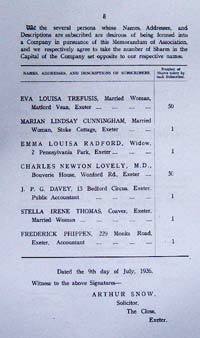 Dr Lovely attended the opening of thirty houses named MILDMAY CLOSE at Exwick on the 8th May 1934. They were named after the Right Honourable Lord Mildmay of Flete who performed the naming. These railwaymens' houses were built thanks to the generosity of the Great Western Railway who advanced the E.W.D.C. a loan of 90% of the cost at a 4% per annum interest. Repayment extended over 50 years. Dr Lovely stated at the ceremony that to date the Company had been able to build nearly four hundred houses for the working classes. By the outbreak of World War 2 a total of 550 homes had been built, including 3 & 2 bedroom flats at WYKES ROAD, BARLEY MOUNT and FOXHAYES ROAD. 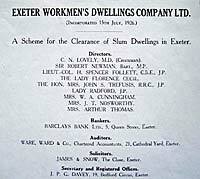 In 1954 the Exeter Workmen's Dwellings Company ceased to be a Company and was granted Charitable Staus and was named The Exeter Housing Society Ltd. One should note that Exeter's first Housing Association, The City of Exeter Improved Industrial Dwellings Company was founded in 1873 and properties were built on Blackboy Road and Follett Building in Mermaid Yard off Market Street. In 1967 the I.I.W.D.C. ceased operations and the prior mentioned properties were transferred to Exeter Housing. Since that time much has happened. The Follets Building was demolished and ultimately 84 modern flats and houses were built at THE COURTS, Market Street. For a number of years the Society managed 38 properties in the City for Church Army Housing. By 1998 works involving the refurbishment of pre war properties had been completed. By the mid nineteen nineties schemes such as PEEL ROW, FERNDALE ROAD, HENEATON SQUARE, THE ROCHES, ROCKFIELD HOUSE, LUCOMBE COURT, OLD SCHOOL COURT and SUMMERWAY were completed. On the 1st May 2008 the Company underwent another name change and to this day (2012) are known as Cornerstone. 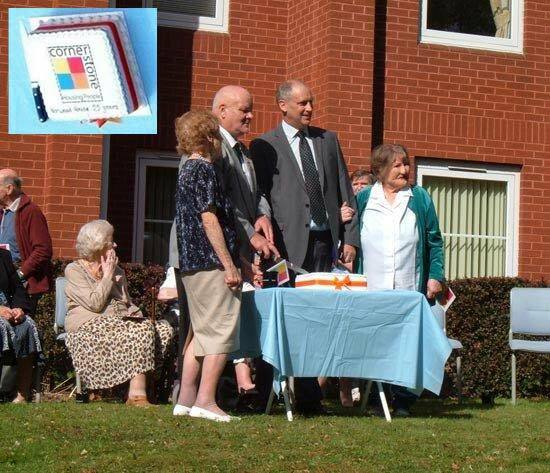 On the 17th September 2010 there was a celebratory Coffee Morning for all the residents of NORWOOD HOUSE, Pennsylvania Road to mark its 25th Anniversary. The building is partially on the site of the former Norwood House Preparatory School and Photographic Memorabilia relating to this School is hung in the Lobby of the present building. Originally the Workman's Dwelling Company Offices were at Bedford Circus but in 1942 the premises were destroyed and the offices were re-located to 18 Southernhay East and they have remained there to this day - however - moves are afoot and Cornerstone will soon relocate their offices to a new building on the site of the former Gaytons Garage on Coombe Street / Western Way. 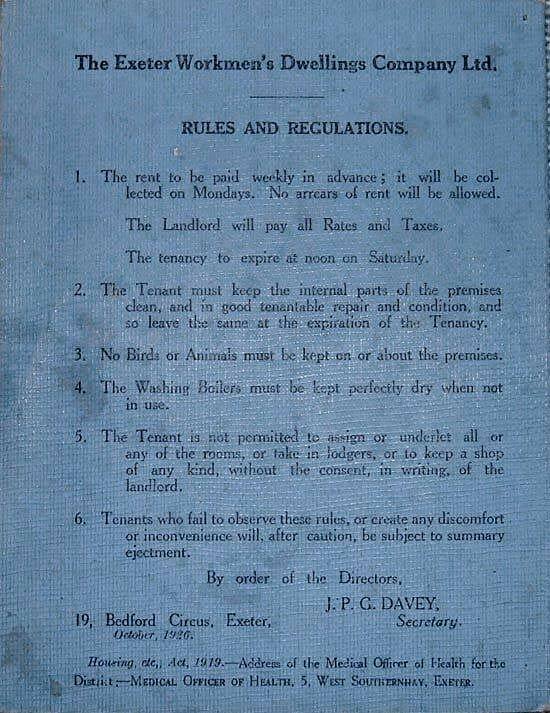 Their policy today is much as it was back in 1926 - "...we will continue to grow and to provide quality accommodation for people in housing need. Maintaining our homes in a culture of sustainability remains our priority. It is due to these factors and our history, that Cornerstone remains an association that both its tenants and staff can be proud of." In addition to his duties as a medical practitioner at Bouverie House in Magdalen Street Dr Lovely was, for some years, appointed Prison Doctor for Exeter Prison and many references to his duties and specific cases he attended to whilst performing that duty are reported in the local newspapers of the day. So also are his involvements in local government whilst resident in Dawlish but it is involvement with the Exeter Workman's Dwelling Company that he should be most famously remembered and articles abound in the papers on this subject. He and his fellow philanthropists should be remembered and acknowledged for the lasting work they performed for the needy and disadvantaged of Exeter - the properties remain as silent witness to the monumental work he and his colleagues embarked upon not so very long ago - within the lifetime of many of the readers of this Tribute. Dr Lovely died on the 29th August 1947. He was cremated at Plymouth, his ashes were scattered in the Garden of Remembrance. No memorial exists to commemorate his achievements by name within the City but from the Express & Echo of the 1st September 1947 is the following quote – "PIONEER OF SLUM CLEARING. 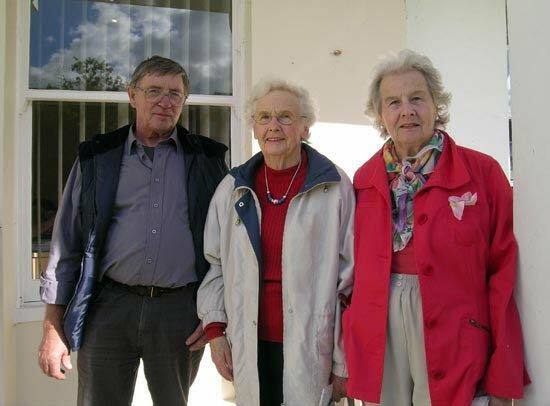 Dr Charles Newton Lovely of Taylor's House Silverton, who has died at the age of 84, was for many years one of the foremost social workers in Exeter, especially in the sphere of slum clearancees and rehousing." Dr Lovely had three children by his first wife and a daughter and a son by his second wife. His daughter, Nancy Rosamond Lovely married Henry Eland Holladay (of Garton & King) at St Davids, Exeter on the 19th August 1939. Henry and Nancy had three sons, of whom I am the youngest - we have all underrated our Grandfather's achievments and hope that in some small way this history will give publicity to what he and his like minded colleagues achieved. Acknowledgements to The Exeter Housing Society and their 80th Annual Report. Cornerstone (www.cornerstonehousing.net) & particularly Rick Williams their Chief Executive for allowing me to view and copy archive material and from which I have quoted at random. Liz Botterill of Dawlish Museum - many thanks indeed. Where possible I have attributed illustrations and images. 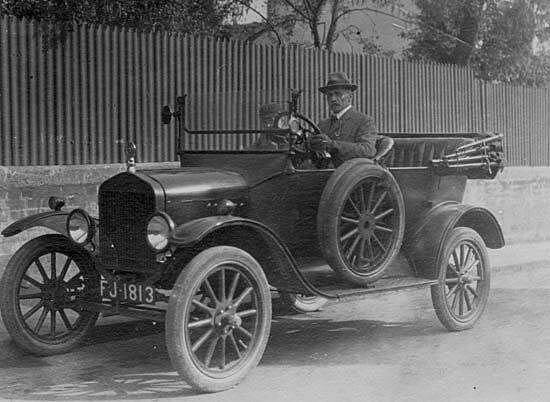 Dr Lovely and his son Noel (in Exeter School uniform and Cap) in an early Exeter registered car. 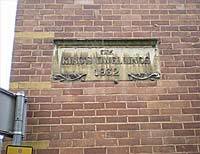 The commemorative Stone on the Kings Dwellings development of 1932. 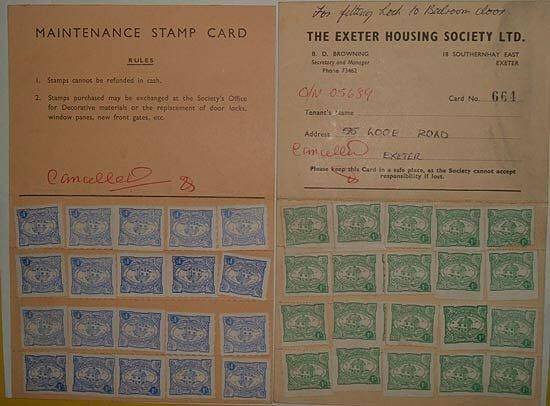 An Exeter Housing Society" Tenants Rent Payment Card for 55 LOOE ROAD, St Davids. Dr Lovely's home and onetime surgery at 18 Magdalen Road. Known then, as now, as BOUVERIE HOUSE. Particulars of the Directors, Bankers, Auditors and Solicitors of the newly formed Company. Leaflet from 1930 publicising the past achievements of the Company and its plans for the future. The seven subscribers who formed the EXETER WORKMANS DWELLING COMPANY on the 9th July 1926, and the number of shares each took. On the same day as the Norwood House celebrations, 17 September 2010, Cornerstones offices at 18 Southernhay East were visited by three of Dr Lovely's Grandchildren. Left to right Richard Holladay, Mrs June Buchanan, and from Vancouver Canada, Susan Dirassar. Standing left and furthest right, the two longest serving tenants of Cornerstone's NORWOOD HOUSE. The lady standing on the left is Mrs Nora Austin whose husband was the proprietor of Austin Outside Caterers of Bartholomew Street West and the Princess Alexandra, Bonhay Road. 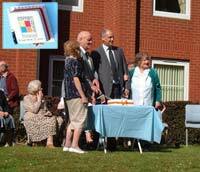 Inset – Cornerstones Cake to celebrate the 25th Anniversary of Norwood House 17th Sept. 2010. Brownes Court, St Thomas photographed in the 1960's is very typical of the poor housing in Exeter before the war. Photo Alan H Mazonowicz.